On Saturday the 9th of November, I joined 26 other Oundle School pupils in the annual Lord Mayor’s Show. The procession began on water with the new Lord Mayor Fiona Woolf, only the second woman in its 800 year history, boarding the QRB Gloriana at Vauxhall. She travelled in a flotilla to the HMS President near St Katherine Docks, from where she went to Mansion House to watch the parade. The School last participated in the procession in 2006, when nine off-road buggies and three cars built by Oundle pupils, and the School CCF marching band, paraded in the Show. 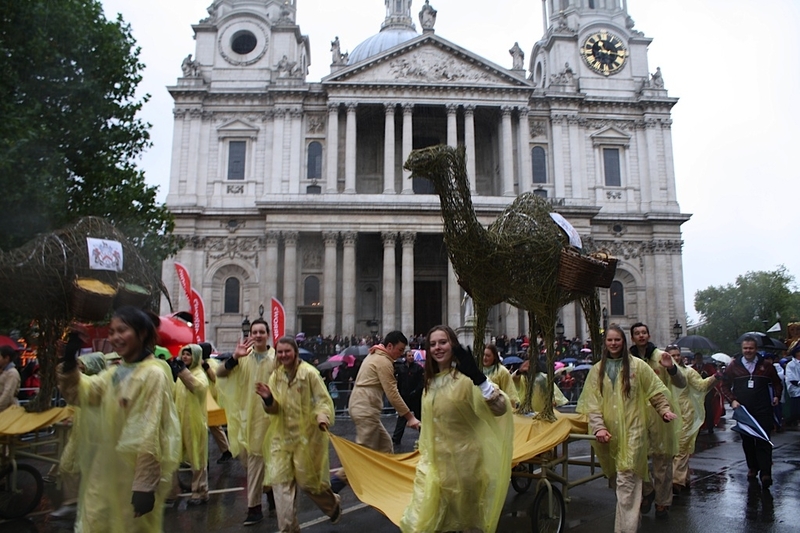 This year, we were part of The Worshipful Company of Grocers’ (the oldest company to be represented in the show) Spice of Life float, with Mossbourne Academy’s Samba Band, Bank of China, Coldstream Guards, 7th Battalion and The Rifles, and one very real camel also participating. The three mile route took us from Mansion House to Royal Courts of Justice. Our job was to wheel three life-sized wicker camels made by staff and pupils in the art and design technology departments. The camels represented the early spice trade of the merchants who originally formed the guild of The Grocers, which was also symbolised by the handing out of 1,000 bags of pepper. Head of Design and Technology, Clive Humphreys, said: “The theme was the ‘Spice of Life’, so a tableau of camels depicting the trade in spices by the Grocers’ Company, seemed appropriate”. The Lord Mayor’s Show has been held every year for nearly 800 years, despite plague, fires, countless wars, and this year, continual rain. The mode of transportation has progressed from river barges to horseback, to the current and magnificent State Coach. Despite the weather conditions, our spirits couldn’t be dampened, as we passed the cheering crowds more than half a million strong, as well as the BBC reporters lining the route of the parade, which included 7,000 participants, 21 bands, 150 horses, 23 carriages carts and coaches, vintage cars, steam buses, tanks, tractors, unicycles, giant robots, helicopters, ships, penny farthings, beds and bathtubs. The event culminated in spectacular fireworks launched from a barge moored between Blackfriars and Waterloo bridges. The Lord Mayor’s Show is particularly important to The Grocers’ Company as 85 of their members have been Lord Mayor over the centuries. Among them was Sir William Laxton, who held office in 1544 during the reign of Henry VIII. He used the success of his London businesses to endow and re-found Oundle’s original grammar school, where he had been a former pupil. It evolved in to Oundle School, and today is still governed by The Grocers’ Company. The Worshipful Company of Grocer, established in 1345, is one of the 109 Livery Companies of the City of London and ranks second in their order of precedence. It is said that the Grocers’ Company used to rank first, until Queen Elizabeth I, as Honorary Master of the Mercers’ Company, found herself in her coronation procession behind the Grocers’ camel, which was emitting unfortunate smells. As a result, the Mercers were promoted.